Jim Crow laws, as most Americans should (hopefully) know, were the racist segregation laws which cemented white supremacy over African Americans throughout the United States from the end of Reconstruction in 1877 to the civil rights movement’s victories in the mid-1960s. But who the heck was Jim Crow, and why did his name grace some of the most odious laws in American history? 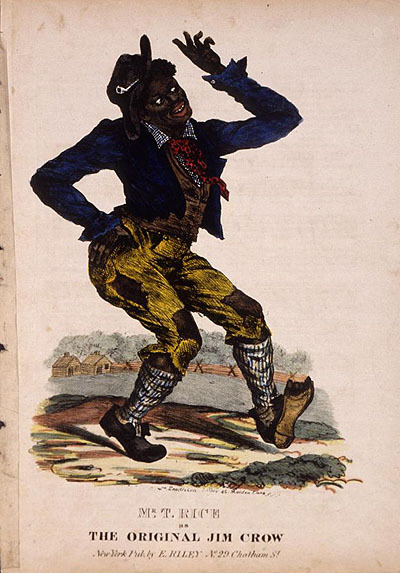 The song was quite popular in the early half of the 1800s, and “Jim Crow” quickly became a disparaging term for blacks, but it wasn’t until toward the end of the century that the name was applied to the various post-Reconstruction “black codes” in the South (the New York Times referred to Louisiana’s “‘Jim Crow’ Law” as early as 1892).